Well it’s now the start of October and we are still waiting to get our house plans into council. We changed some aspects of the house design which delayed things but now we are waiting on the engineer (who had previously been the snappy one) and the grey water system design guy and THEN we can submit them. I was hoping to have them in by the end of next week at the latest and if they are not ready by the end of this week – heads will roll! 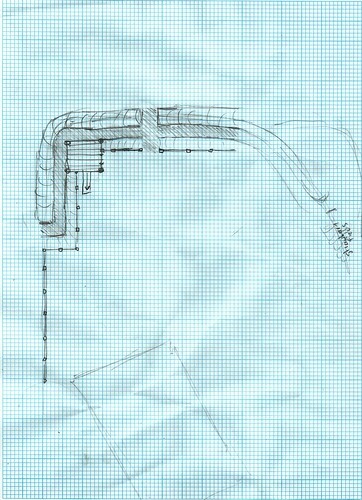 We’ve also been working on some plans for the gardens. Right now the focus is on the white picket fence that will be running around most the main platform, the path and the gardens beside the path and the terraces directing below this, all now being referred to as The Westbank. Some planning is also going into the area beside The Westbank, now know as the Gazabo Strip (because that’s where the gazebo will be going – ok that’s a bad pun). The strawberry patch and care of the existing fruit trees is also high on the list. I have yellow note cards with lists and everything! 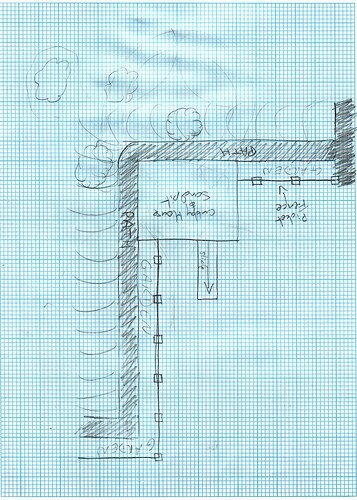 Bellow or two sketches of the proposed picket fence/path garden area. The square in the top left corner is the planned fort/castle/cubby house and sandpit, the curve on the right indicates the terrace where my gazebo will be and near that is the strawberry patch (the big rectangle down the bottom left represents the house). This is a closer in view of the “Children’s Garden” area. Sandpit/Castle/Fort thing is the main feature here, with a trap down, ladder and slid plus arrow slits in the walls. The picket fence will run up to this area on two sides and the building itself will have walls to stop unwanted escapees. The planting on the terrace bellow is probably going to be trees and bushes, spaced apart so as to afford small army’s to creep up to the castle and some cover from arrow fire above. To feed the besieged villagers and knights inside the castle I’m planning on edging the fence with loads of edible pick-and-eat fruits (like orange berries, blueberries, thornless-non-spreading blackberries and anything else I can find that doesn’t grow taller then the fence or have prickles and thorns). I’m also hoping to create a few small garden beds for kids to plant their own edible delights like carrots, lettuce, beans and peas. I’d like to make the area feel enclosed, without blocking the view from the house exactly. I really want this to be a space kids can disappear to, get up to all sorts of mischief without feeling like they are being constantly watched, but I can also feel that they are safe. Another thought that just occurred to me is putting up a really small shed for them to store their own gardening tools, bows and arrows, swords etc in. The walls on the south and west sides will probably be lattice and I’ll install hooks and shelves for storing of various sandpit tools and whatever else the kids choose. As you can probably tell, I’m really excited about this space and it’s potential for fun and creative imaginative play. The strawberry patch will be tackled this week by Pip and myself (hopefully tomorrow if the weather stays fine). I’ve already netted the 3-4 meter area to help keep birds away from the strawberries that are currently growing. Tomorrow we need to really get into some weeding, checking the PH of the soil, fertalising and mulching the area as well as planting a bunch more strawberries. I’m hoping to plant a few different varieties with different growing times, spread out the growing season, yum 😉 I believe the ones that are there are probably summer ready and they don’t seem to send out runners. Lots to do, it’s great to see daylight savings here and the warm welcoming weather.